One set of Work Plans for grades 1 thru 4 is included with the purchase of the JE-L Lab and is found in the Instruction and Control Manual. The Work Plans are designed to track the progress of the children. 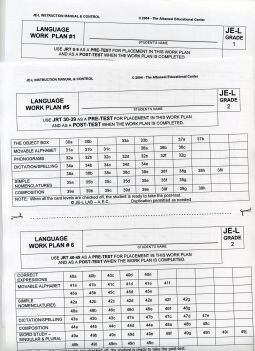 After a child has taken the first Review Test (Pre-Test), the teacher can pull the corresponding Work Plan that already has all the printed numbers of the exercises on the Review Test which also correspond to specific exercise cards in the Language Lab. As the child receives presentation lessons and completes the exercises, the teacher crosses out the numbers and when the Work Plan is completed, the student takes the same Review Tests (Post-Test) which will reveal the progress made. The Work Plans are included when the JE-L Lab is purchased.